Some people are storming their local electronics megastore for a new HDTV. Other people are scouring online for a new tablet or laptop. If you have ambitions that are simultaneously more modest and more practical this Black Friday, then I’ve got a handy little deal for you. 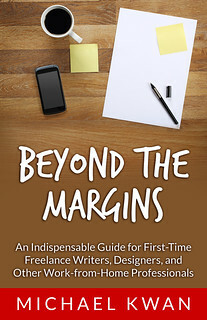 My book, Beyond the Margins: An Indispensable Guide for First-Time Freelance Writers, Designers, and Other Work-from-Home Professionals is on sale for 25% off from the CreateSpace eStore. The book contains several key lessons and considerations that you’ll want to keep in mind if you’re thinking about going into business for yourself as an artist, freelancer, consultant or other independent creative. Enter the coupon code 4GXMMM7L during checkout to get your 25% off discount. The coupon code is valid today, Black Friday, through to the end of day on Cyber Monday. If you would prefer to buy Beyond the Margins from Amazon or you would like the Kindle e-book version, you can do so here. That might make more sense if you plan on ordering a few more things from Amazon. Also, if you have Amazon Prime, Beyond the Margins is now part of the Kindle Lending Library too. Signed copies are available upon request. Click here to get Beyond the Margins from the CreateSpace eStore.